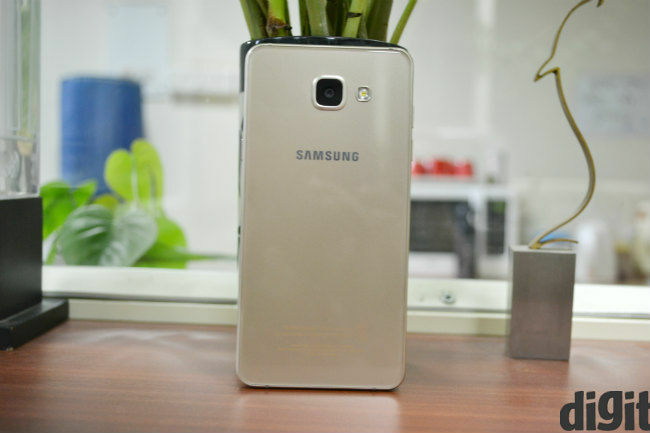 The Samsung Galaxy A5 is amongst the best designed phones in the market, but at Rs. 29,400, it is just too expensive to recommend. It's performance isn't comparable to its competitors and you would be better of buying an HTC One A9 or the much cheaper Nexus 5X. With its A-series smartphones, Samsung has been playing the same game that Chinese manufacturers like Xiaomi and others have, but in its own way. The Galaxy A8 was basically a metal and glass clad version of the erstwhile Galaxy S5, while the original Galaxy A5 and A7 were attempts at providing value for money smartphones at comparatively affordable prices. Build and Design: The best of Samsung today.. The metal and glass design that Samsung adopted with the Galaxy S6 has been used in the A5, and that makes this one of the best looking smartphones in this price range. It’s only 7.3 mm thick and weighs 155 grams, which means it’s a treat to carry around in your hand and pocket. Combined with the 5.2 inch display and thin bezels, it makes for one of the most ergonomically sound smartphones out there. There’s a metal frame on the side, with chamfered edges, completing the overall premium look and feel of the Galaxy A5. The polished glass on the back is surprisingly more resistant to fingerprints than phones like the Sony Xperia Z3+ and even the Samsung Galaxy S7 Edge and Galaxy S7. It’s almost the perfect design. I say near perfect only because I would have preferred if the phone was narrower. 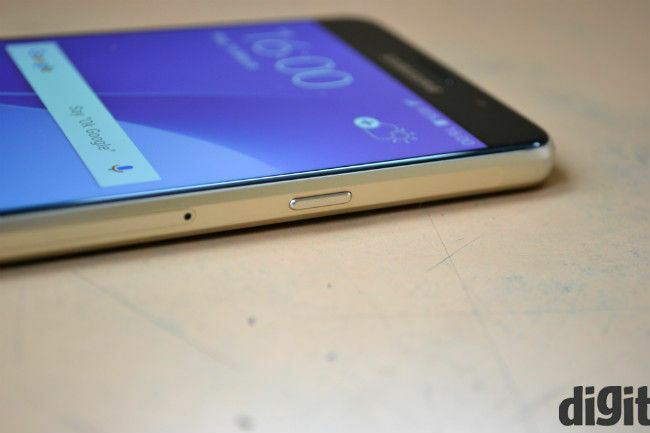 The Samsung Galaxy A5 is 71mm wide and 144mm long, and that is quite ergonomic. But, if you compare that to a OnePlus X, which follows basically the same design philosophy, you realise how much of a difference a few millimeters can make. The OnePlus X is 69mm wide and 140 mm long, and while that may not seem like much, it does make a difference. However, I’d still rate the Samsung Galaxy A5 as one of the best designed smartphones in the market today. It’ll be a treat for anyone who wants their phone to be ergonomic and easy to use. It’s almost the perfect design. The 5.2 inch FHD Super AMOLED display is predictably good. On the default adaptive display mode, the display doesn’t oversaturate colours a lot, but you will see the yellowish tinge if you switch to the Basic mode. Overall though, it’s quite bright, which suits usage in outdoor conditions, and the colours are really accurate, at least in the adaptive display mode. It is a tad washed out, compared to Samsung’s flagship displays though. This is where things fall apart. The Snapdragon 615 SoC from Qualcomm is simply not the processor you want on your smartphone in this price range. The difference between this and the Snapdragon 617 SoC on the HTC One A9 is miles ahead of the Galaxy A5. In fact, the Xiaomi Redmi Note 3, which costs less than half of what the A5 does, can deliver about double the processor performance. But the processor isn’t the only issue. For some reason, the Galaxy A5 doesn’t support Open GL 3.1, which is a big bummer for gamers. Combined with the fact that the Snapdragon 615 has some heating issues as well, it results in easily discernible frame drops. Even in regular usage, the phone lags when you’re switching between apps, and Flipboard always freezes for too long when you swipe across to it. Of course, this is also because it isn't a native app, but the freezes are more tolerable in the Galaxy A8. While the HTC One A9 didn’t sport the most powerful processor, Android Marshmallow out of the box, combined with an able processor, ensured that the phone was a treat to use. The Samsung Galaxy A5 comes with Lollipop out of the box and is the opposite, in terms of performance. The phone lags when you’re switching between apps, and Flipboard always freezes. While the Galaxy A5’s 13MP camera boasts the same F1.9 aperture as the Galaxy S6, you would be wrong to expect the same quality. The Sony IMX135 sensor is smaller than the IMX240 sensor on the Galaxy S6, which results in a drop in image quality. While the shutter response is quite fast, images lack details and struggles with shadows. Under low light, the phone takes quite a bit of time to focus as well. The camera is comparable to the HTC One A9, which wasn’t the best camera phone to start with. The processing algorithm on the Galaxy A5 also seems different from the one used in Samsung’s flagship devices. Overall, the Galaxy A5 has a good camera for a phone priced at Rs. 15,000, but at Rs. 29,400, it falls behind. The camera is comparable to the HTC One A9, which wasn’t the best camera phone to start with. The 2900 mAh battery on the Galaxy A5 should last a day for average users. On the Geekbench 3 battery test, the phone takes just over 10 hours to fall from full to no charge. On regular usage, I was able to get the phone to last for about 15 hours, which means you’re going to have to charge it twice a day. Bottomline: Best and worst of Samsung..
Samsung has so far refused to play the price war going on in the Indian market, and the Galaxy A5 continues that trend. At Rs. 29,400 though, it is really difficult to recommend the Samsung Galaxy A5. It is indeed one of the best designed phones in the market, but there’s really no other area where it beats the competition. Perhaps a Snapdragon 617 SoC would have been a better idea for this device. what is new in this and how is this better?